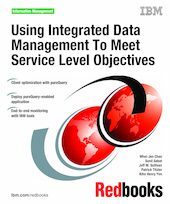 In this IBM® Redbooks® publication, we learn how The Great Outdoor Company, a fictional retailer of outdoor products, uses Integrated Data Management solutions by IBM to optimize data management for performance, productivity, and manageability, allowing them to get the most from their data assets and to ensure they can meet service level objectives (SLOs). We discuss how organizational and infrastructure complexities can negatively affect overall performance and productivity and how an integrated data management approach can help bridge these silos and gaps to provide end-to-end data and data application life cycle support. To illustrate, we focus on how to optimize an enterprise Java™ application using the Optim Development Studio (formerly Data Studio Developer) and pureQuery Runtime to improve performance, manageability, and security. We discuss the practical aspects of managing the deployment and maintenance of pureQuery applications. Because an integrated data management approach extends to the problem solving aspect of the data life cycle, we also discuss how DB2 Performance Expert, DB2 Performance Expert Extended Insight Feature (PE/EI), and IBM Tivoli Composite Application Manager (ITCAM) can help you pinpoint problems in complex application environments.